Did you know you can follow some of your fav bloggers, i.e. ME!!!! on Currently Obsessed? You can see some of the items they are buying or lusting after - click on an item you like right from my picks and you head straight to the website to purchase. So easy and so FUN!!!!! You can heart the items you like too, so it's easier to go back (when you inevitably want to buy!) as well. Hope you have wonderful weekends planned - I am on a plane heading to visit my brother today & couldn't be more excited!!!! A Navy Crew tournament, family dinners and a nice weekend away - WaHoo!!!! Have a fabulous weekend. And yes, I will stalk you, hehehe. I love this feature of CUrrently Obsessed. 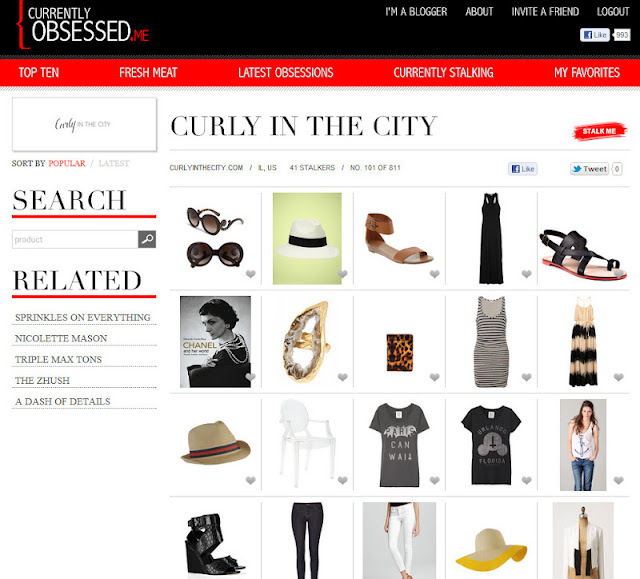 Yet another online platform to become obsessed with. I feel like stalking you would be a bad idea for my checking account. Just sayin'. I hope you have a most wonderful weekend! Safe travels, friend. Can't wait to stalk you and check out your favs!